First, your hostel proprietor gives you wrong time for the bus. Well, not necessarily the wrong time for the bus, but the wrong time for the mini-van to come pick you up and take you to the actual bus. After some frantic calls, you finally get to the bus terminal — a small, nondescript storefront with two huge buses in front. You wait. As people of various nationalities rush around you, asking worried questions and receiving no answers from the Cambodian bus operators, you start to wonder if you’re at the right place. After all, there is more than one night bus that leaves from Siem Reap. You shove your $24 ticket at someone who looks like he drives the bus, or at least has ridden it before. He points to one of the buses. Inside the seats are numbered. A girl agrees to switch with you so you can sit by your girlfriend (the guy who booked your tickets didn’t make sure of that). That girl is headed to a different city (Sihanoukville) and you’re a little nervous that this might not be the correct bus. But when you ask, there is no definite answer. The bus is a little larger than a Greyhound and has comfortable multi-colored blankets on the seats for you to use, which is great because the bus is freezing. Despite the seemingly unorganized nature of the whole affair, the bus leaves right at midnight. You settle down to sleep, occassionally adjudsting your blanket or peering out of the windows. At 6 a.m., you arrive in Phnom Penh and the bus driver empties everyone into the parking lot of a small, outdoor bus station. “Wait here,” the driver says and then he’s gone. Your fellow passengers look confused too, heads darting back and forth, looking for any indication of where the connecting bus may be. So we all wait together under a tin awning. Several times, men come by asking where we’re going. When we answer, “Ho Chi Minh City” they say “OK, OK” and walk away. You hop in the mini-van and after about 10 minutes, your driver pulls onto a side street where a real bus is waiting. You shuffle out and onto the new bus. It’s only six more hours to Ho Chi Minh City. Soon, you reach the Mekong River and the bus appears to be driving straight into it. It’s not until you’re right at the shore that you realize there is a barge to take you to the other side of the river. “This is crazy,” you think. After you arrive on the other side, the border town of Bavet comes into view. Soon enough, you are ushered off the bus, passports are taken and you wait. Then, you’re corralled with everyone else to a large building where a man with a permanent bad day calls out your name. He hands back your passport and you wait by the bus again. Then, everyone gets on the bus, the bus driver goes a few hundred yards to reach Moc Bai on the Vietnamese side of the border and the process repeats. There doesn’t seem to be any problems and, after a while, everyone heads back on the bus. Another few hours and the traffic increases noticeably. Before you know it, around 1 p.m., the bus drops you off in the middle of what appears to be some sort of motocross race. But no, this is just Ho Chi Minh City. You avoid the taxis and moto drivers at the station, because you know they will try to rip a newcomer like you off, and head a few blocks to pull out your first Vietnamese dong and grab a taxi to your hotel. Hi Alex, just read your article about the night bus. May i know how you get the ticket of Virak Buntham bus? Do they have email address for online booking and their office address at Siem Reap? Appreciate if you can provide some information. Thanks. Thanks for writing Fong. Unfortunately, there is no website or email address. The only way to book these in advance is through your hostel/hotel. If you don’t know where you will stay, then you’ll have to get these bus tickets when you arrive. Good luck! From your article, the bus condition seem like not bad except that it is quite risky during Bus exchange in Phnom Penh. They are transferring passenger with a mini-van to the real bus and have no idea whether the mini-van is legit. How long have you been waiting there before transferring to the real bus? All around the bus is a good idea, especially if you have a limited time in Southeast Asia. It is not really that risky during the bus exchange at PP, I was just illustrating how — if you didn’t know beforehand — it could seem very sketchy. I didn’t know whether to trust these minivan drivers. But in the end, I was glad I trusted them or I would’ve missed my bus. Any bus riders should make sure they keep their ears open for these mini-van drivers so they don’t miss their bus. We waited about 25 minutes in Phnom Penh before the minivan took us to the real bus. Hi Alex, thanks for the replied. In addition, may i know what time you choose for the Night Bus, 7pm or 11pm? What time you reach the Check point? I wonder the Checkpoint at Borderline still open if our Night Bus depart from Siem Reap on 7pm. 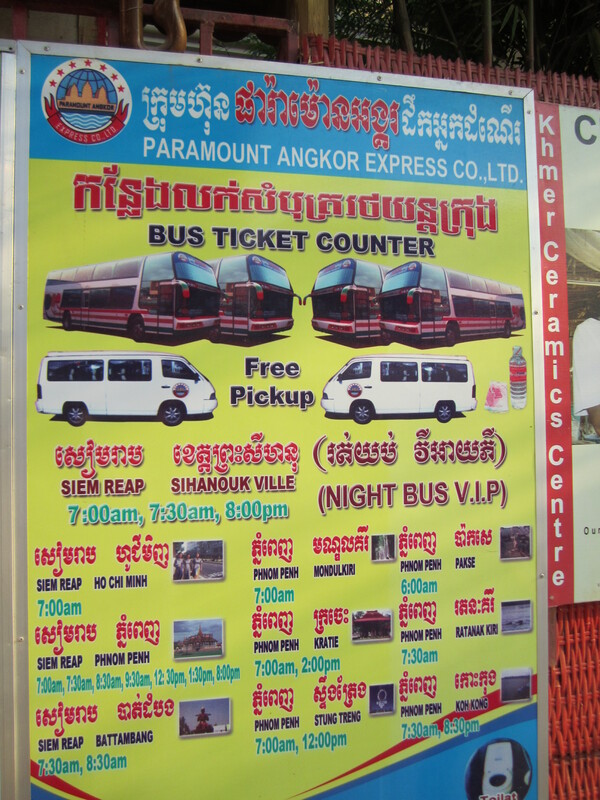 We are planning to book this night bus to Ho Chi Minh City, depart from Siem Reap on 7pm. I did the 11 p.m. though in my case, the bus did not leave until midnight. It arrived in HCMC around 1 p.m. (13 hour trip). One of the photos I posted shows one company’s schedule and it shows that a 7 p.m. bus arrives in HCMC at 9:30 am. Hi Alex, my Guest House just opposite to the Old Market. May i know the address of the counter that sell the ticket? Hi Alex, many thanks for your helpful post, will be there in Sept and will try out this option! sorry this is late I didn’t get the message. I hope you found your way. For future readers, I do not know exactly where to buy the ticket. I had my hostel take care of it. Afterward, they only charged me maybe 3-5$ commission on that. I would do that, because otherwise you are at the whim of the people at the bus counters for times, etc., which could change. My guesthouse/hostel even called them to pick us up b/c they left a little early. It helps in these situations to have someone looking out for you when you haven’t done this before, even for an extra $5. I”m glad you found it useful! The travels in Cambodia give me so much pleasure, as it is passing all the human emotions, from absolute joy and wonder to sadness and melancholy and back to amazement and a everlasting feeling of tranquillity and love in my heart. is there any night trips bus going to Cambodia from Ho Chi Minh City? yes, it runs both ways. Next post Bipartisan Guide to Ridiculous Legislation is back for 2011!